First of all, let me just say that I had every intention of writing more frequently while away. Obviously, that didn’t happen. The whole road to hell thing, you know what I mean. I’ll be trying to play catch up, so bear with me as I start to recap the cruise. Brian vs. the Midnight Buffet is still going to happen, but not today. So anyway… last Tuesday, July 20, we loaded up the car and headed south to Lorton, VA. Lorton is better known as the northern terminus for the Auto Train. There ain’t much else, let me tell you. After checking in, we boarded our superliner car with our friends Mike & Mary Newell. After navigating a very narrow stairway, we were confronted with our frist challenge, namely where the heck to put our stuff. The Superliner Roomette is not a bad place to sit. There are two facing seats, a big window, just not a lot of space. After unpacking the tech, it was time to head back for the free wine and cheese. The cheese was good, the wine, well, was a little pedestrian. Once back in the roomette, I set up the GPS, the power strip, the iPhone chargers, the netbook, etc. I realize that we were on railroad tracks, so GPS wasn’t real helpful, but it was nice to know where we were at any given time. The train started heading southbound through Virginia. Auto Train is billed as the world’s longest passenger train, which is not entirely accurate. Maybe the longest train that actually carries some passengers. The auto racks make up a larger part of the consist than passenger cars. We signed up for late dinner and at 9 PM, we headed back to the dining car. I had been informed that the food was actually pretty good onboard the train and I wasn’t disappointed. There were four main entrees (beef, chicken, seafood and vegetarian. Between the four of us, we had all the entrees and we were all pleased. I had the crab cakes and found them very tasty. They were served with vegetables and a nice spicy remoulade. Laura had the stuffed manicotti, which was the meatless choice. Mike had the medallions of beef and Mary went with the chicken. After dinner, we went back to the roomette to find that the attendant had converted it into bunks for the overnight. Here came the challenge. Being plus sized, both Laura and I found the accommodations a little cramped. 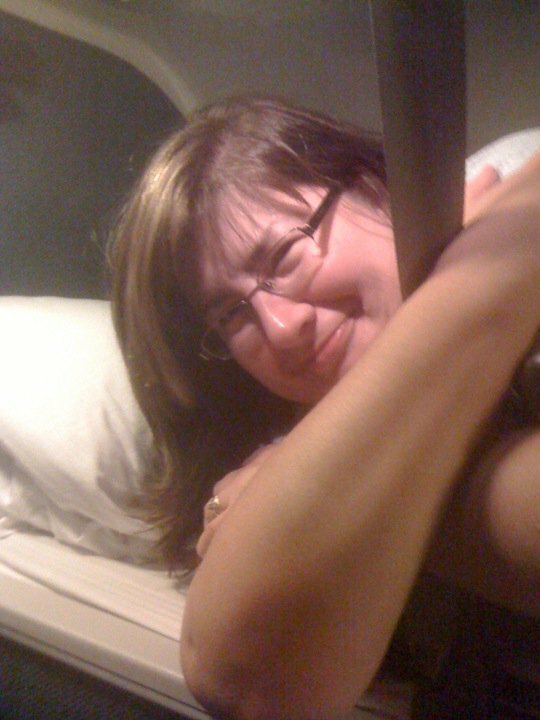 This is when we started referring to the roomette as the bouncy broom closet. Laura wound up on the top bunk, where there is webbing to make sure you don’t fall out of the bunk. After a bumpy night (the engineers had the hammer down to make up some lost time) we got showered and dressed, then grabbed breakfast. Continental, but pretty tasty. Not long after breakfast, the train pulled into Sanford, FL. It’s quite an operation in Sanford. First the autoracks are uncoupled then the passengers cars are split. Seems that Sanford is a smaller terminal (it is being refurbished) and takes a little more work. After leaving the train, you are directed to a holding pen to wait for your car to be offloaded. We were among the last 40 cars to be offloaded, but we found our car as we left it. The Amtrak valets even cover the seat with a plastic cover to keep the seat clean. Very nice operation. We stopped by CVS to pick up some missing essentials, including a toothbrush and a SunPass toll transponder. I signed up for the service while in the parking lot of said CVS, only to find out that the account would not be active for three hours. That helped a lot. Mike handed me a two-way radio and we headed east bound and down (for those of you keeping score at home, I did download the Jerry Reed song on the way, much to Laura’s chagrin) to Fort Lauderdale and the Embassy Suites. Granted, there was an obligatory Chick-Fil-A stop along the way. After several hours and a driver change, we made it into Ft. Lauderdale. I will continue with the cruise story when we arrive at home and I don’t have to type in the dark. I wish you all a great weekend, hopefully not as brutally hot as it has been here in Florida. Very cool that you could take the train and “pack the car” with you 🙂 I haven’t slept on a train but that sounds interesting… not sure we ever will since my hubby gets motion sickness but I’d be up for trying it sometime. Laura gets motion sick and she managed ok. Maybe a scopalomine patch would help?